The games have begun and being American we like to eat and drink while we watch our favorite football teams. Me, while I like the Colts, baseball is my thing. The playoff games just around the corner and my family will gather together to watch the games. So whether it is family or friends getting together, food is present. Bake a cake using the CK Products Pantastic® T-shirt pan and frost it with your team colors. The beauty of this pan is it can be used for your child’s ball team, birthday, professional baseball as well as your pro football parties. Use the MLB and NFL candy molds. They are versatile and may be used for ice cubes, jello, mints or chocolate candies. Bake cookies – yum. There is the football helmet, football and baseball bat cookie cutters. It is so simple to make the baseball with a bit of frosting and candy writers. 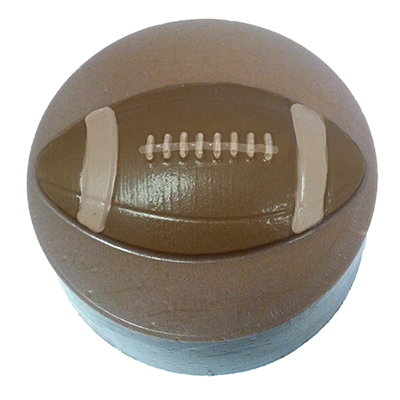 A plain dipped chocolate sandwich cookie is good, but made to look more impressive with the emblem of a baseball, football, football helmet, golf ball or soccer ball on top. Take your mold, melt confectionery coatings (using the Candymelter Pallette makes it easier to paint it the details. It gives you a pallet of melted chocolate, kept at the correct temperature and when you are done, it stores unused chocolate) paint in the detail and chill it. After chilling, coat the mold with chocolate, insert the sandwich cookie and cover the cookie. Once the chocolate has set, chill briefly and pop out of the molds. Munch, munch, munch…. Enjoy the game!